I may have written about fried rice once, a long time ago. I don’t cook as much Asian food as I used to because it’s more difficult to get the ingredients here. Granted, I did live in a Korean/Chinese neighbourhood back in Sydney – it was easy for me to pick up a piece of freshly made char siu pork or roast duck that hung in the windows of restaurants and shops from my local high street. I sort of regretted trying to make Nasi Goreng recently because of this very situation. I used to make it, funnily enough, using a Dutch Unilever product, that contained the perfect flavour profile with just the right amount of curry vs. chilli and other fragrant herbs. I’ve tried jars and sachets here too, but none had quite the same balance of flavours and then I realised that I’m just being sentimental. 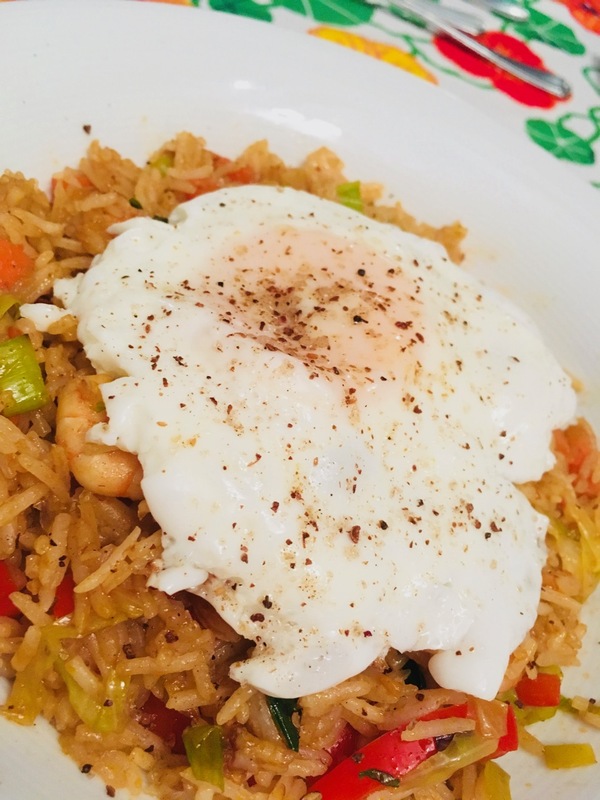 My efforts were worth sharing, because of course no one else in the UK will have quite the same fondness for Conimex nasi goreng as I do. So, you’re wondering, what is this nasi goreng? According to wikipedia, it literally means “fried rice” in Indonesian, “stir fried rice in a small amount of cooking oil or margarine, typically spiced with kecap manis (sweet soy sauce), shallot, garlic, ground shrimp paste, tamarind and chilli and accompanied by other ingredients, particularly egg, chicken and prawns.” Sums it up pretty well I’d say. Nasi goreng is not as bland as regular Chinese fried rice, because it has been seasoned with all those delicious ingredients like kecap manis, tamarind and I’m certain even curry powder in some cases. You make it the same way as fried rice, but you can pack it full of a lot more vegetables and really make a meal out of it. Finally, instead of faffing about with eggs inside the stir fry – you simply plop a fried egg on top making this meal one of my all time favourites. 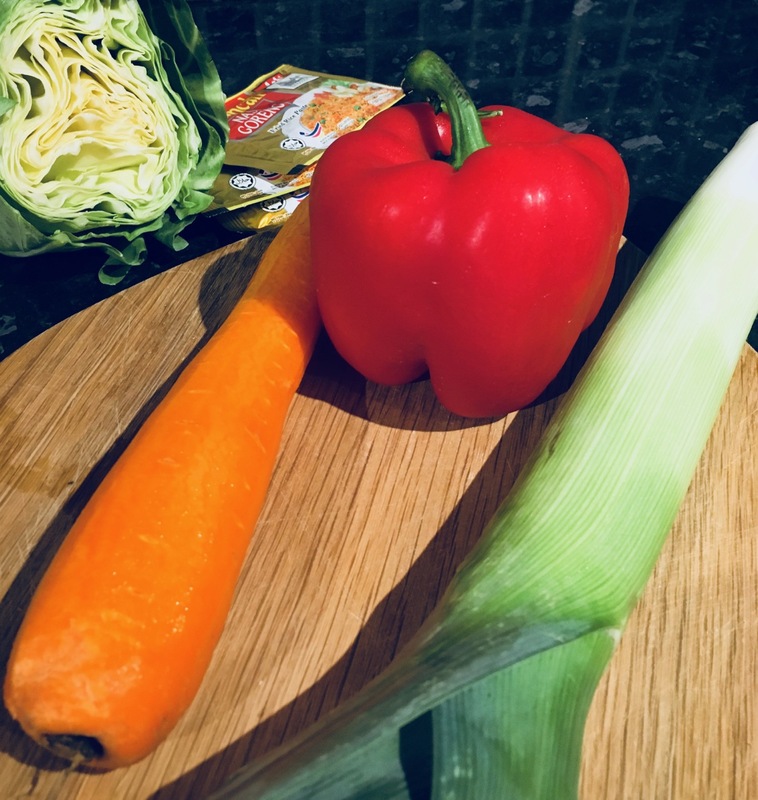 If you want to pack your meal with vegetables, it’s best to stick to blanced carrot and beans, cut into very small pieces, red peppers, finely sliced cabbage, leeks and if you like, peas and corn. To season, simply buy a jar or paste or packet of nasi goreng, and follow the suggestion on the packaging. The most important element to getting it right is the rice. You have to cook your rice in advance so it has time to cool down and dry out a bit. If you use freshly cooked rice, your dish will become a messy slop of mushed rice. 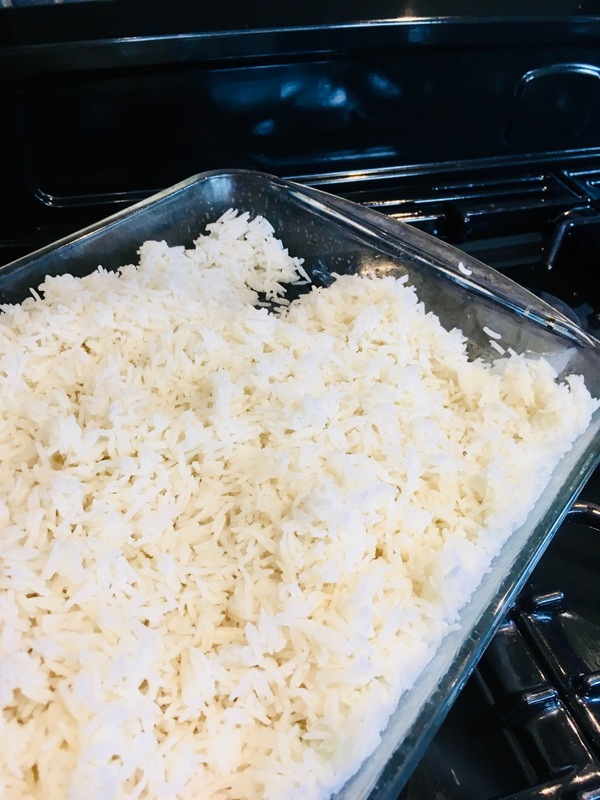 So, leftovers are ideal, but otherwise, I simply cook up the rice – I use basmati – and then pour it into a baking dish to cool down. Then, once it’s cooled down, I coat the rice in a little bit of vegetable oil, further helping to separate the rice particles. 1-2 cups of basmati rice, steamed and cooled. Take care not to over cook the rice. Pre-cooked meat – prawns, chicken or pork will work well. In a very large frying pan or wok, stir fry the leeks and vegetables first, adding the nasi goreng paste during the saute process. Once you can smell the paste, add the rice. Stir well, until all the rice is coated, and hot. Add the meat, stir in until coated and hot enough to serve. Serve up bowls of the nasi goreng, with a lightly fried egg on top.